The largest piece, 40 feet long, as it is just pulled out of the trailer. It will make a great table for someone. I heard about a shipment of wood that was coming to Duluth from New Zealand. We get cargo here from all over the world but this was different. This was wood that was in the ground 42,000 years before Lake Superior appeared on the earth. And that was 8,000 years ago. It was brought here by a company in Ashland called Ancientwood, LTD, not a bad name for a product like this. In New Zealand it had caused problems for farmers for years since their implements got stuck in it and it was hard to grow crops on top of it. 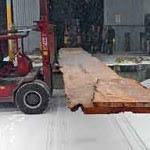 With problems like that, why not send it to Duluth and then Ashland where Bob Robert Teisberg, founder and president of Ancientwood and his team can put it in their kiln, dry it out and then make beautiful furniture with it. They also send the wood out to other woodworkers.